"Twenty years of hindsight prove how deeply Tapscott understood the impact the Internet would have on the way we live, work, play and learn. This important book, now updated, is just as relevant today as it was then." Two decades ago, The Digital Economy changed the way the world thought about the Web and Internet. While everyone else was in awe of "websites" and "dot coms," Don Tapscott was among the first people to argue that the Internet would fully transform the nature of business and government. It goes without saying that his predictions were spot on. When Tapscott was writing the original edition in 1994, he was living in a world where Netscape had been just introduced as go-to browser, websites didn't do transactions, dial-up was the only way to get online, and mobile phones sightings were rare. Google, YouTube, eBay, Facebook, Twitter? They didn't exist. 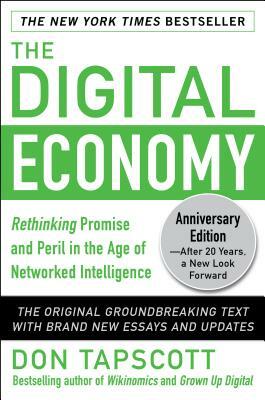 Preserving all the original text as it appeared 20 years ago, this new edition includes detailed essays ending each chapter--Tapscott's highly informed reflections on his predictions, along with new forecasts of where the digital world is headed. "1994 was a good year. Netscape Navigator and The Digital Economy. With this anniversary edition, Tapscott provides lucid insights for the next stage of these amazing times." "Brilliant. Governments can learn from The Digital Economy how to democratize access to prosperity, minimize social and economic divides and transform government and democracy for the 21st Century." "We're now into three decades of terrific insights and analysis from Don Tapscott about the digital revolution Read this book "
Don Tapscott is one of the world's leading authorities on innovation, media, and the economic and social impact of technology. Named one of the world's most important living management thinkers by Thinkers50, he advises business and government leaders around the globe. Tapscott is the author or coauthor of some of the most widely read and cited books on technology in society, including Paradigm Shift, Growing Up Digital, Grown Up Digital, The Naked Corporation, Digital Capital, Wikinomics, and Macrowikinomics.